PRICKLY PEAR, also called OPUNTIA, is part of the cactus family. This species comes originatelly from Mexico and has been widespread in various arid and semiarid parts of the world. Today the cactus is cultivated in northern Africa. The fruit pulp has a high nutritional value and is used in the food industry for its sweet and flavorful taste. 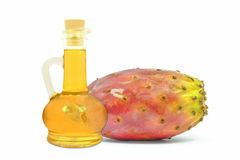 The seeds, which contain only 5% of oil, are cold pressed to give the rich and precious PRICKLY PEAR SEED OIL. Its exceptional composition : 75% to 85% unsaturated fatty acids (65% linoleic acid, omega 6), and a high rate of tocopherol (1085 mg/kg on average) have made the prickly pear oil the new trend oil in cosmetics. Furthermore, the oil contains more than 6% Delta7 sterols, a component rarely found in vegetable oils and recognized for its performance mainly in the revitalization field and antiradical protection. The beautiful golden color and the nice quickly absorbed texture makes it easy to use in all kind of cosmetic formulation.